1. Gently sauté the onions in the little oil until soft and golden, add the garlic and cook for about 1 minute. 2. Add the mince to the pan and brown well. 3. Add the curry paste and cook for a few minutes. 4. 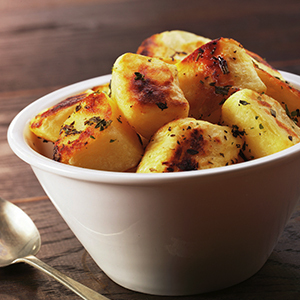 Add the McCain Chef Solutions Simply Roasts and stir well. 5. Add the tomatoes and the stock, bring to the boil. 6. Pour in to an ovenproof dish. 7. Cook in the oven for 30/40 mins. 200°C/Gas Mark 7 until potato is cooked through. Stir through the cooked peas. Check seasoning and serve.